Who are you, “Tamara Drewe”? I am way, way too easily distracted. Am busy putting together a list of fall movies for a big fall movie preview (to be published Sept. 5), and took a moment to ponder Stephen Frears’ new film, “Tamara Drewe.” I haven’t seen it (though I hope to see it at the Toronto Film Festival next month), and had never heard of the serial cartoon/graphic novel it’s based on, by Posey Simmonds, that’s been running for some time in the London newspaper The Guardian. As luck would have it, you can read all 110 episodes online, right here — and I kind of got sucked into it. Good stuff, though I’m not done yet. Anyone a fan of this series? I’m always interested in what Frears is up to — love how his movies, like “The Queen” and “High Fidelity” and “Dirty Pretty Things” and “Cheri” and “Dangerous Liaisons” and “The Grifters,” take us to so many completely different worlds — and “Tamara Drewe” looks like promising territory. 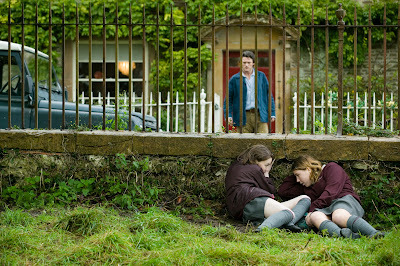 Jessica Barden, Luke Evans and Charlotte Christie in “Tamara Drewe.” (Photo by Peter Mountain, courtesy of Sony Pictures Classics.) No idea what they’re doing — I haven’t gotten far enough in the cartoon series yet, as unfortunately there are other things that I’m supposed to be doing — but will find out soon enough.